Choose the plan you want to upgrade/downgrade to. Your new plan will be active immediately, and you will pay the difference between what is left of your old subscription and the new one. You will have your current subscription until next payment, where you will go to the new plan. 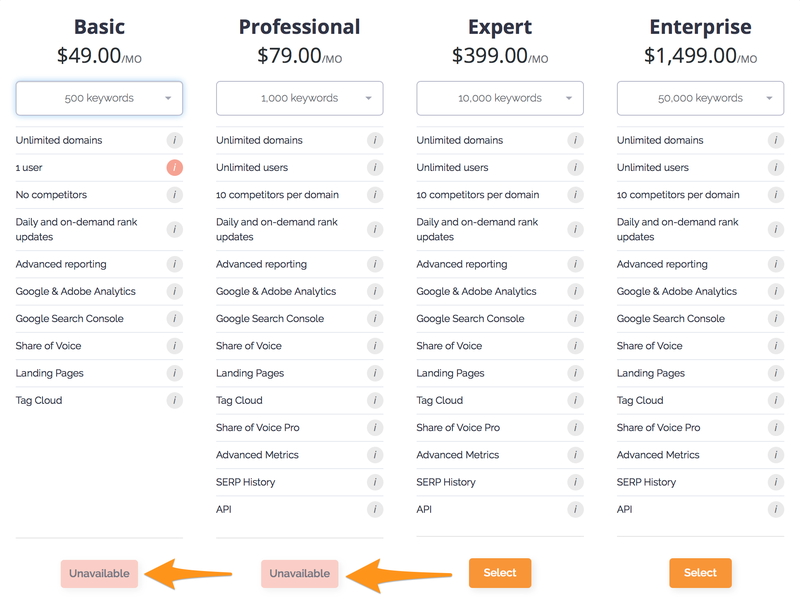 If you want to downgrade, but the downgraded plan is "Unavailable"
If the plan you wish to downgrade to shows as unavailable it is either because you have too many users or keywords on your account to downgrade. Simply remove the necessary users and/or keywords so that your account meets the requirements of the new plan. To learn more about removing keywords, click here to read our article on how to do so.